Dell, HP/Compaq, IBM/Lenovo and Intel Certified Parts Fast! E-Merrilltech.com offers a vast array of OEM Desktop/Laptop computer replacement parts ranging from motherboards, hard drives, power supplies, memory and replacement case parts. These are the Top Ten Dell &amp; HP computer parts from E-Merrilltech.com. 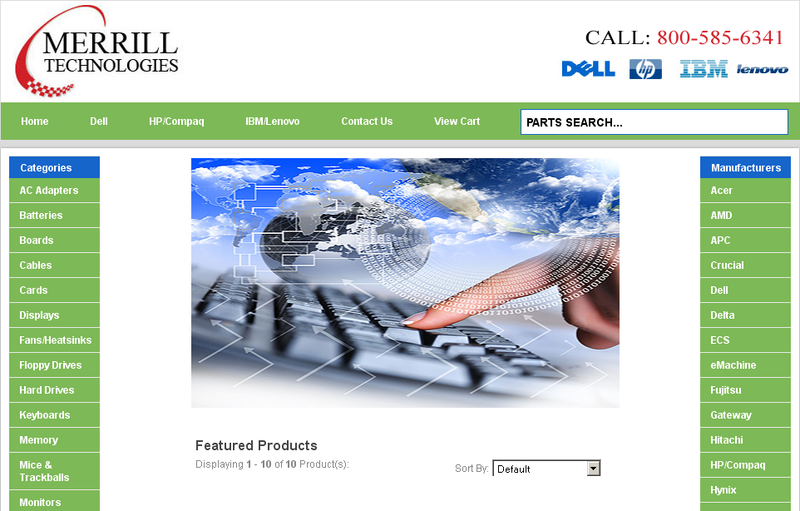 E-Merrilltech.com: Dell, HP/Compaq, IBM/Lenovo and Intel Certified Parts Fast! Celebrating 16 years in business and introducing E-merrilltech.com. Merrill Technologies online store. Merrill Technologies stocks the largest inventory of Dell, IBM, and HP/Compaq spare parts and accessories for laptop, desktops and servers. Our parts supply includes AC Adapters, Batteries, Boards, Cables, Fans/Heatsinks, Floppy Drives, Hard Drives, Keyboards, LCD Displays, Memory, Mice, Motherboards, Optical Drives, Plastics, Port Replicators, Power Supplies, Printers and Printer Hardware. Serving customers since 1995, we are your online partner. Visit us at E-merrilltech.com, or on Ebay, Amazon, and Google shopping. Merrill Technologies Blog at WordPress.com.